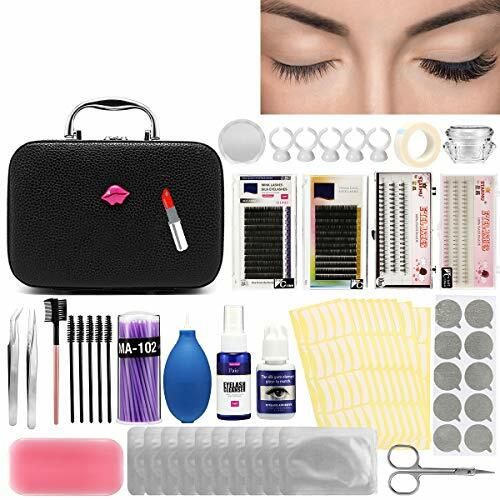 Description: Type:Eyelash Extension set Shelf life: 3 years Size: 21.5*15*9cm Weight: 908g Include: 1*Dual-use eyebrow comb 5*Mini eyebrow comb 1*Mini eyebrow comb 1*Forehead stickers 1*Barrel swab 2*Tweezers 1*Single eyelashes 1*Mixed single eyelashes 1*10D hair 1*5D hair 1*Eye patch 1*Pipette blower 1*detergent 1*Odorless glue 1*Makeup remover 1*Grafting non-woven fabric 1*Round glue pad 1*Small scissors 10*Eyes affixed stickers 1*Glue pad sticker 5*Graft ring cup Note: 1.The real color of the item may be slightly different from the pictures shown on website caused by many factors such as brightness of your monitor and light brightness. 2.Please allow slight deviation for the measurement data. 3.Please allow 1cm-2cm error due to the hand measurement . 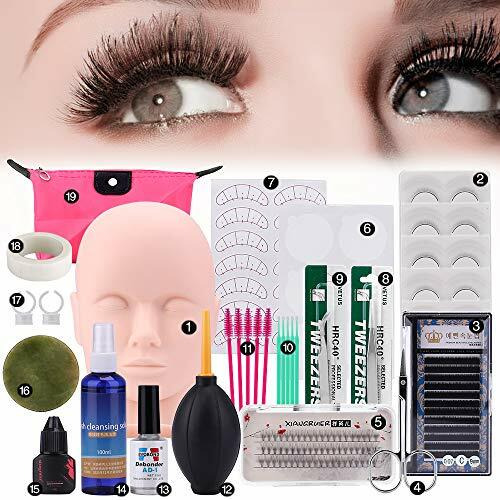 Description: Type:Eyelash Extension set Shelf life:3 years Package Weight: 1020g Package Included(same as picture): 1.1x Mannequin Head 2.5 pairs of False Eyelashes 3.1 Box x 12 Row Individual Eyelashes 9mm 4.1 x Scissors 5.1 Box x Cluster Eyelashes 6.1 x Round Stickers 7.1 x Digital Eye Sticker(7 Pairs) 8.1 x straight tweezers 9.1 x curve tweezers 10.1 x bag Disposable Cotton Wands 11.5 x Eyelash Comb 12.1 x Air Puffer Blower 13.1 x AD Debonder 10ml(Eyelash Glue Remover) 14.1 x Eyelash Cleaner 100ml 15.1 x Eyelash Extension Glue 16.1 x epoxy gasket 17.2 x Glue Ring shaped holder 18.1 x Tape Warning: 1.Clients eyes must be kept closed throughout the entire application procedure. 2.For advanced technicians only. Do not use on yourself. Note: 1.The real color of the item may be slightly different from the pictures shown on website caused by many factors such as brightness of your monitor and light brightness. 2.Please allow slight deviation for the measurement data. 3.Please allow 1cm-2cm error due to the hand measurement . 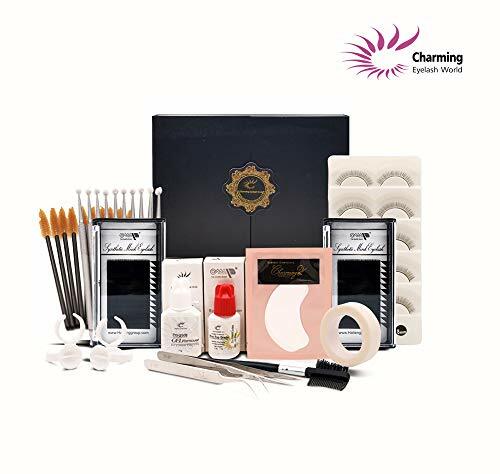 Specification: Condition: 100% Brand New Type: Eyelash extensions Exercise set Head stock: Silicone Package Includes: ①1x Practice False Head ②1x Straight Tweezer，1x Curve Tweezer ③Silicone Eyelash Extension Pad ④2x Ring Holder ⑤5x Eyelash Comb ⑥3x Box / 12 Rows Individual Eyelashes (8mm,10mm,12mm) ⑦1x Eyelash Extension Tape Note: 1.The real color of the item may be slightly different from the pictures shown on website caused by many factors such as brightness of your monitor and light brightness. 2.Please allow slight deviation for the measurement data. 3.Please allow 1cm-2cm error due to the hand measurement . 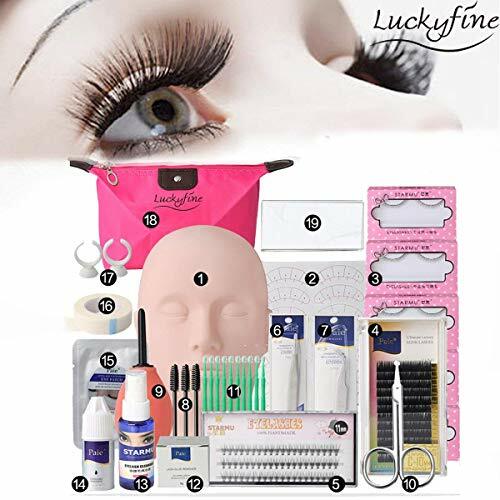 Description: Type:Eyelash Extension set Shelf life:3 years Package Weight: 1020g Package: 1.1pcs Makeup Mannequin Head 2.1pcs Digital Eye Stickers 3.5pairs of False Eyelash 4.1Box 12 Row Individual Eyelashes 10mm 5.1Box Cluster Eyelashes 6.1pcs straight Tweezers 7.1pcs curve Tweezers 8.3pcs Mini Eyelash Brush 9.1pcs Air Puffer Blower(For drying) 10.1pcs Scissors 11.10pcs Disposable cotton swab 12.1pcs Eyelash Glue Remover 5g 13.1pcs Eyelash Cleaner 14.1pcs Eyelash Adhesive 10ml(odorous) 15.1pcs Eyelash extension eye patch 16.1pcs Tape 17.3pcs Glue Ring shaped holder 18.1pcs makeup bag 19.1pcs Eyelash Glue Holder Warning: 1.Clients eyes must be kept closed throughout the entire application procedure. 3.For advanced technicians only. Do not use on yourself. Note: 1.The real color of the item may be slightly different from the pictures shown on website caused by many factors such as brightness of your monitor and light brightness. 2.Please allow slight deviation for the measurement data. 3.Please allow 1cm-2cm error due to the hand measurement . If you have any questions, please contact us. 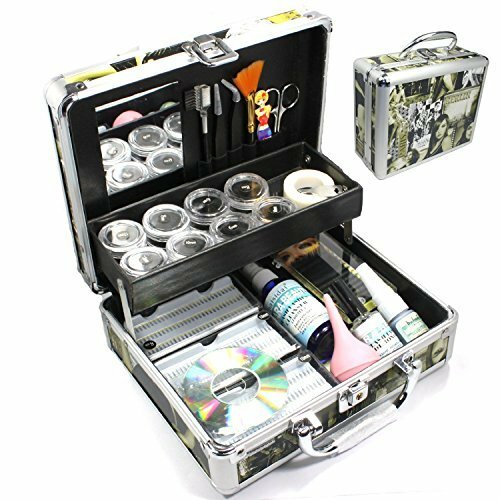 Professional Eyelash Extension Kit. 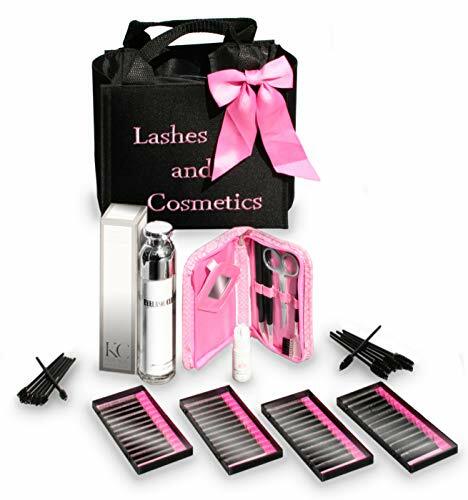 Lashes and Cosmetics Eyelash Extension System is a new kit featuring STRONG HOLD Eyelash Glue. Long Hold is a Bond Adhesive lasting up to 4 weeks. It has a long hold time and incredible retention power and is used by professionals, but can also be used as an in home eyelash kit. Dry Time 3-4 Seconds. The Ultimate Eyelash Extension System is a semi-permanent eyelash extension kit made up of Mink Single eyelashes which are comfortable to wear, feel natural and look great. The eyelash extensions in the lash kit vary in length and shape so looks can be fully customized and the best part, they last for weeks. 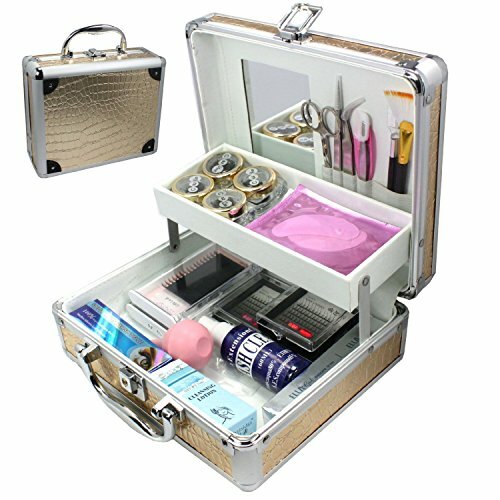 Eyelash Extension Kit Features: Eyelash Extension Case with Clear Zip Up Bag. 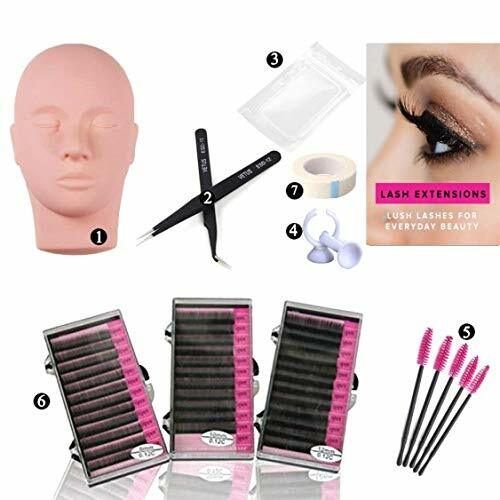 4 sets of Mink Single Eyelash Extensions (Short 8mm, 10mm, Medium 12mm,Long 14mm in C Curl, Eyelash Extension Glue Adhesive - Black, 5ml Long Hold, Eyelash Cleanser, Stainless steel curved tweezers, Stainless steel straight tweezers, Tool Kit in Pink Faux Snake Skin, and 50 mascara wands (long and short for inner eye area). 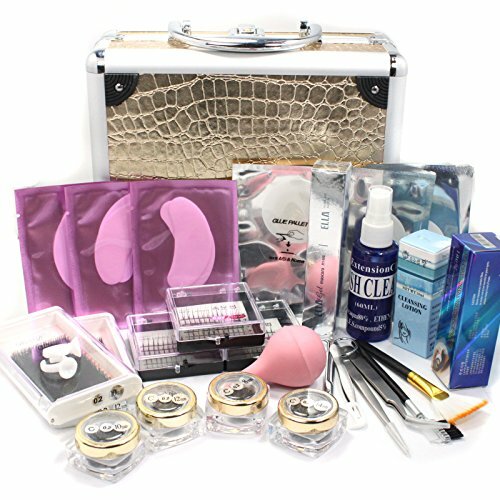 A great kit for eyelash extension professionals or at home use. 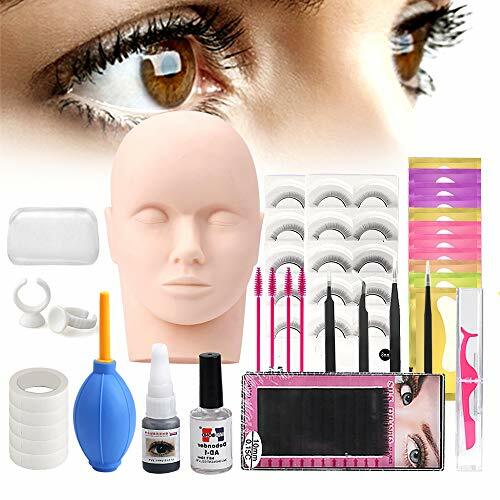 Package Included:1x Mannequin Head 100x Disposable Mascara Wands100x Glue Rings1x Eyelash Glue (For mannequin head only)1x Lash Glue Remover (For mannequin head only)4x Precision Eyelash Extension Tweezers1x 15 mm Individual Eyelashes5x Eyelash Tape5 x Self Adhesive Practice Lashes1x Air Blower10x Under Eye Patches Pads1x Silicone Forehead Sticker1x Eyelash Applicatior WandWarning:1.Clients eyes must be kept closed throughout the entire application procedure.2.For advanced technicians only. Do not use on yourself.Note:1.The real color of the item may be slightly different from the pictures shown on website caused by many factors such as brightness of your monitor and light brightness.2.Please allow slight deviation for the measurement data.3.Please allow 1cm-2cm error due to the hand measurement . Mink Lashes are considered the best lashes due to the soft and full look. This is a set that comes with 4 Trays 8mm,10mm,12mm,14mm. Easy to Apply to hand for faster application. Just take the strip off the tray and apply to hand. Apply all four sizes so you can create lash looks faster on clients. KC Republic eyelash extensions contour and curve to the natural lash so the bond of glue lasts longer. 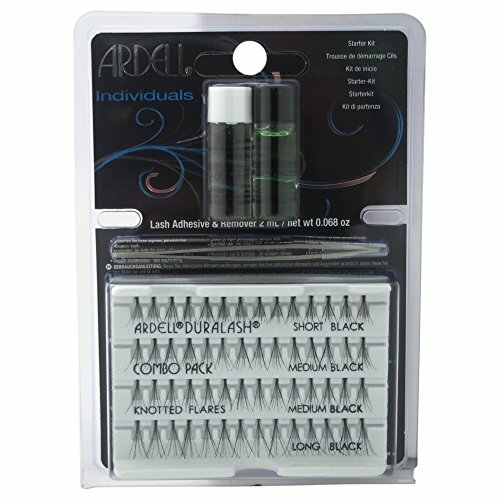 Eyelash extension kit comes with hypoallergenic eyelash extension glue. Eyelash glue for sensitive eyes and contact users. Curved Tweezers is wonderful for picking up eyelashes and placing them directly where you want with out the sharp tip pointed towards the eye. Instead it points away from the eye for safety. Store glue in dry cool place. 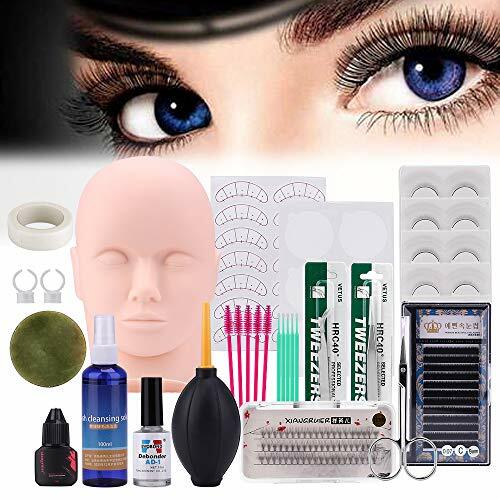 This is for eyelash extension artist tools.All chemical products (including Adhesives, Remover, . )are for PROFESSIONAL USE ONLY. Untrained use is not allowed and we cannot be held responsible. You must be trained, certified and insured adequately to use our Products. 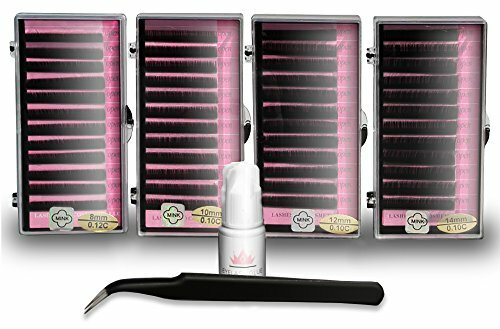 Compare prices on Eyelash Extension Kits at LiveSaler.com – use promo codes and coupons for best offers and deals. We work hard to get you amazing deals and collect all avail hot offers online and represent it in one place for the customers. Now our visitors can leverage benefits of big brands and heavy discounts available for that day and for famous brands. We try to makes comparison shopping easy with Product Reviews, Merchant Ratings, Deal Alerts & Coupons. Find Deals, Compare Prices, Read Reviews & Save Money.